Women approaching menopause are often surprised and frustrated to find that changes in their hormones trigger a number of changes in their skin, many of which are unwanted. Being prepared can help you adjust your skin care program with the earliest signs of menopause and know when to see a dermatologist. Two of the most common skin concerns of women approaching and in menopause are hair loss and dry skin. Hair growth and amount of shedding can be affected by a number of factors that often appear in a woman’s 40s and 50s. Below are several ways women can reduce the risk of hair thinning in menopause. Many women experience a slow increase in weight during midlife despite regular exercise and a healthy diet. A common response is to crash diet or eliminate entire categories of food. Unfortunately, not only does this typically not lead to sustained weight loss, it can trigger an episode of hair shedding called telogen effluvium. This is when up to 1/3 of your hair enters a shedding phase at one time and you can lose 300-400 hairs a day instead of the 100 hairs a day typically seen. Aiming for slow and steady weight loss though healthy changes in your diet. Making sure you have at least one protein rich meal per day. Eating iron-rich foods like green, leafy vegetables and beans or lentils. Women of color are particularly at risk for damage and breakage, so gentle hair care practices are especially important to maintain strong, beautiful hair. Minoxidil is one of the best initial options to consider if you are experiencing hair loss related to menopause. Many women inherit the tendency to have thinning of their hair with age and this can become apparent at the time of menopause. Minoxidil 5% (high potency foam) has been shown to thicken hair and help it grow. Fortunately, this treatment is available without a prescription and the solution or foam can be easily incorporated into your beauty routine. There are many supplements available that advertise that they help hair regrow. New safety concerns have come to light regarding the risk that biotin may lead to inaccurate lab test results. Until this is better understood, women should be cautious about choosing to address hair loss with vitamins. Skin loses some of its elasticity and thickness with menopause. This can result in dull, dry skin that itches or flakes. Fortunately, there are several steps women can take to prepare their skin for these changes and allow it to glow at any age. Avoid smoking. Cigarette smoke prematurely ages the skin and can lead to wrinkles and enlarged pores. Protect your skin from the sun. Regular use of a broad-spectrum, high-SPF sunscreen and hats/sunglasses/sun protective clothing will keep your skin from losing its resilience. Remember to protect your neck, upper chest, arms and hands, not just your face. Be gentle to your skin. Many products like toners and exfoliating treatments are too harsh for daily use in menopause. Using moisturizers with hyaluronic acids, glycerin or ceramides can help to combat dry skin. Consider making an appointment to see a Board Certified Dermatologist if these steps are not enough to keep your skin and hair healthy. There are many medications and procedures that can help fight the effects of menopause on your skin. Dr. Rashmi Unwala is a board certified dermatologist at Cleveland Clinic. She sees patients at Cleveland Clinic main campus. 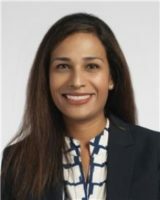 Dr. Unwala earned her medical degree from the University of Miami School of Medicine and served her residency at Jackson Memorial Hospital in Miami, Florida. She joined Cleveland Clinic in 2019. Please call 216.444.5729 to make an appointment with Dr. Unwala. Hair Loss, What’s A Woman To Do? Hair Loss…It’s Not Something That Just Happens To Dear Ole’ Dad! At Home Beauty Tips for the New Year!